Teresa Fazio's "No One Left Behind"
Late the next morning, my birthday, our stomachs rumble. “There’s a place that sells shawarma nearby,” I say. “Amir’s. We’ll go for lunch.” The pita’s our closest contender for the fare that was sold at the tiny market on our old Iraqi base. I order us two chicken shawarmas. Jack pays. As the smell of roast meat wafts our way, I remember the market’s drumbeat of wailing music, pressed layers of bread and chicken, pools of grease under our plates. The teenage waiter had always brought us a tray with two glass teacups, a sugar cube beside each. Jack had left a dollar each time. Then the market staff trucked to Fallujah, ten miles away, on a supply run. The “supplier” was a ruse; instead, insurgents kidnapped the waiters, gouged out their eyes, cut off their tongues, and murdered them. Our shawarmas come wrapped in thin whole-wheat pita. They’re different from the doughy folds we knew in Iraq, where the baker slapped round loaves into a clay oven. Amir’s chicken, too, proves less luscious than the market’s sweet, peppered chunks cut from licking flames. The baklava tastes drier than the honeyed slabs we’d devoured in the desert. One thing hasn’t changed, though: the flatware. We stab neon-pink pickles in wax paper cups with thin knives and bendy plastic forks. We take measured bites, careful not to drip sauce on our jeans. We can’t wipe greasy fingers on dirty desert camo anymore. 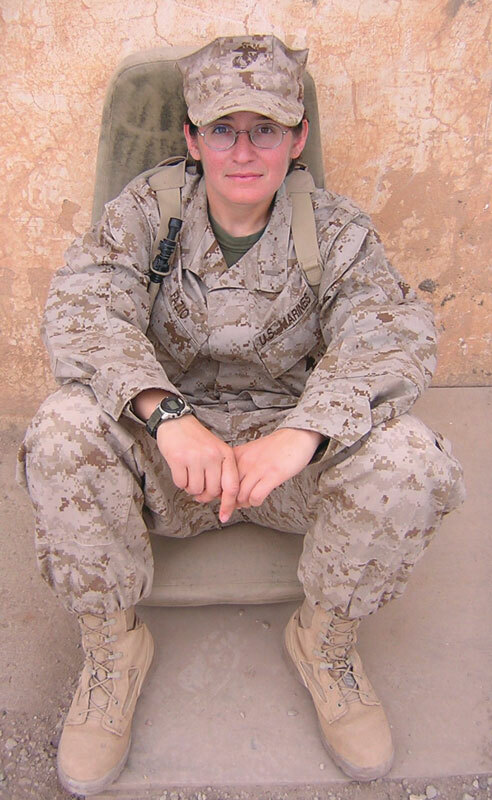 Teresa Fazio served in the U.S. Marine Corps as a communications officer from 2002 to 2006. Her writing has appeared in the New York Times, Task and Purpose, among other outlets. This story was adapted from Fazio’s winning entry in the Words After War 2015 Submission Contest.